Resources for story and storytelling in worship and religious education. Each day Alemitu and her mother leave their small Ethiopian village to fetch water from the watering hole. Water, she learns, is more precious than gold. On the long walk back, hunger often roars in Alemitu’s belly like a lion. One day, Alemitu’s mother brings her to a place where she tells her the lion will never roar again. Thus begins her journey from an orphanage in Ethiopia to her adoptive family in the United States. Eva Alemitu (Eva is the name she takes after she goes to the U.S.) observes the world around her as she moves through her journey. She cannot take for granted the cool clean water from the tap, or food on her plate. She comes to appreciate that the sun that shines on her in her new homeland is the same sun that still shines on her first homeland. 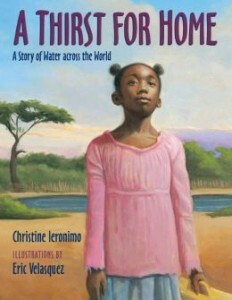 Christine Leronimo’s book uses a gentle, even tone to portray some very intense experiences for any child. The book works because Leronimo allows the character’s experience of loss to speak for itself. The author’s tone is greatly helped by Velasquez’ illustrations, which convey a sense of both beauty and dignity. Of course, the story cannot offer complete resolution. How could it? Because of the intensity of the issues portrayed in the book, worship leaders and religious educators will want to think carefully about their own context and be prepared for the questions the story might raise for young listeners. This picture book is beautifully illustrated by Eric Velasquez in mixed media and oil on watercolor paper. His illustrations of Alemitu in Ethiopia have a particularly luminous and sun-touched quality. With about a thousand words from the first person perspective, this story probably works best read as a picture book. That said, a very skilled storyteller could pull-off this story, but telling it in Alemitu’s voice without either trivializing or over-dramatizing her experiences would require both lots of rehearsal and the right touch. This entry was posted in Picture Book. Bookmark the permalink. Looking for other stories? Search Here! All reviews are searchable by theme and motif. Need a story featuring a rabbit? Relating to generosity? Search below by key word or browse the archives.